The 1990 reprint of Tony Hillerman's 1978 Listening Woman. Hillerman's publishing history shares much history with the Harper publishing label. In 1990, Harper & Row, with whom Hillerman began publishing in 1970 with his first novel, The Blessing Way, was purchased by Rupert Murdoch's News Corporation and was subsequently broken into HarperCollins, which published hardback books, and HarperPaperbacks, which was launched to market mass paperbacks. By the time HarperPaperbacks began publishing editions of Hillerman's novels, Hillerman had been working with the graphic artist and designer Peter Thorpe for four years. 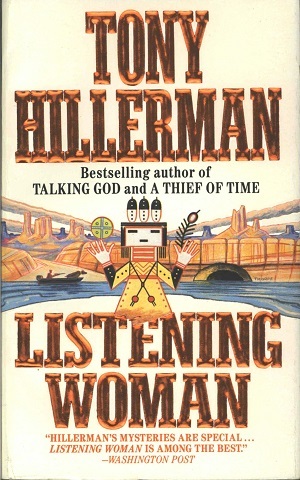 The cover design of this mass paperback edition of Listening Woman displays what has become the iconic look of Hillerman covers: symmetrical graphics that incorporate elements of Navajo sandpainting and cosmology with elements of the novel's plot-line. The inside back cover displays a black-and-white photographic portrait of Hillerman and a short biography. Binding: Paper boards with full-color graphics on the front and back covers.